boxer shorts, three woolly hats (one for each of those absolutely essential photo opportunities at the top of each peak), and a pair of good boxing gloves for beating off hungry sheep. It's a dilemma, but follow our ‘Beginner's Basics kit list' and advice and you'll have more of what you need and less of what you don't. Bear in mind that there are no hard and fast rules. A basic polythene bag-type liner will keep the contents of your pack dry in wet conditions if your pack is not fully waterproof. Mid June may sound like the perfect time to take to the hills hiking... but you know the English weather! Some people feel comfortable taking most of their wardrobe onto the hills, whilst others will happily venture out with nothing at all. It could be wet so have some good weatherproof clothing and maybe a good fleece, and possibly a spare hat and gloves for if it really tips it down. (If you're really considering the worst you could also include a crepe bandage, some sterile dressings, zinc oxide tape, and a triangular bandage in case you need to construct a sling)! Protect yourself against the ‘worst case scenario’ and make sure you’ve got some blister treatments (Compeed works well), and possibly some aspirin or paracetemol to cope with headaches and aching limbs. And because we all hope its going to be a sunny day... don't forget the sun cream. it’s worth stating again... if it's a good sunny day you'll need sun cream, maybe lip balm, and those cool ‘photo shoot ready’ sun glasses. Ok, the boxing gloves are just a joke. However, if a starving hungry sheep (in the red corner) is eyeing up the contents of your lunch box (in the blue corner) you may just wish you’d packed a pair. they’ve probably taken more kit for a walk up and down the hills than they ever needed, so they’ll give you a good idea of what you're likely to need and what's just a pointless burden. A GPS and a compass is probably not necessary. A map is not bad idea (it may also make your walk more interesting to know where you are and what you’re looking at)! Don’t forget your mobile phone, and make sure the battery's topped up! 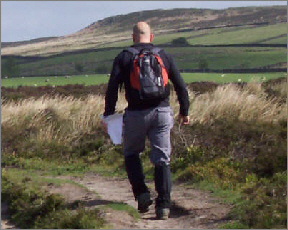 When you registered for the walk your mobile number will have been recorded onto the register of walkers. Network reception may not be perfect in all areas, but it gives the organisers half a chance to contact to you if necessary. Not a bad idea, particularly if you're prone to falling over, dropping down a deep hole, or being bitten by a sheep. Carry a basic first aid kit to tend to minor injuries. You'll want to be able to cope with cuts, grazes and maybe minor injuries, but not open heart surgery in the hills, so be realistic. A basic kit could include a selection of plasters, antiseptic cream, and some antiseptic wipes to clean cuts and grazes.